Lawrence Matthews III is a Memphis-based artist whose work will be featured at the upcoming MEMFix event at Film Row on Saturday, September 24th from 11-5. See his murals in person at the event! Born in Memphis, TN in 1991, Lawrence Matthews III came from a family who encouraged him to be an artist from a young age. Being raised in a racially tense environment, his experiences and interests manifested themselves in his visual art. Matthews graduated from Germantown High School in 2009. After experimenting with different styles and influences, Matthews came into his own creating art combining Post Modernist, Pop Art, and contemporary influences to tell the story of the African Descendant living in America. His work ranges from oil paintings, to collage, photography, and ready-made sculpture, to music and film. A recent recipient of a Bachelor of Fine Arts degree from the University of Memphis, he has shown work in multiple group exhibitions around the mid-south. He was awarded “Best of Show” in the University’s 31st Annual Juried Student Exhibition in 2014. He also was awarded the Deans Creative Achievement Award and Department of Art Creative Achievement Award in 2015. In 2016 he was awarded the Arts Accelerator Grant from Arts Memphis. Matthews has also had many solo exhibitions spanning painting, photography, and installation. "All of my visual art deals with history, more specifically black and southern history. When asked to create art for Film Row, I knew a little but not enough I felt to create something special. I began to ask my more informed friends about the film history here and I was directed toward King Vidor’s film Hallelujah. What drew me to use material from the film in my work was the fact it was the first film to have an all black cast without the use of Blackface. It was also the second “talkie” ever, the first being Al Jolson’s The Jazz Singer. I was also drawn to the fact it was actually shot here in Memphis. Hallelujah is one of the only films of the time period to not portray African Americans in racist, stereotypical fashion. I felt like it was a crime that in all my time in Memphis I had never heard anything about the existence of this film. I strove to make something that not only honored this film and its historical significance to history but its creation in black communities in Memphis. I collaged book pages containing images and information from the Memphis Massacre in 1866 and as well as Memphis’s film and theatre history creating layers of history for the paintings to sit on. 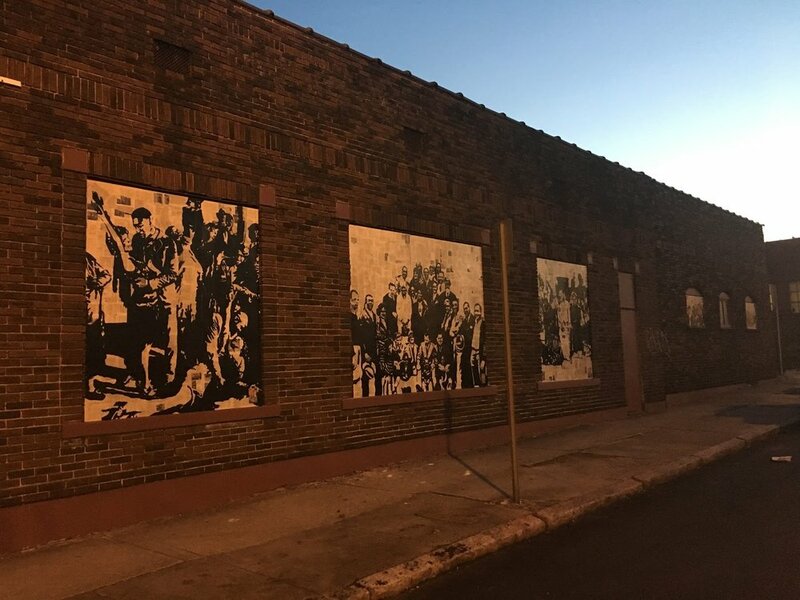 Ultimately I wanted to create something positive and beautiful that also told multiple layers of Memphis Film history in a way that reflects the communities surrounding Film Row."